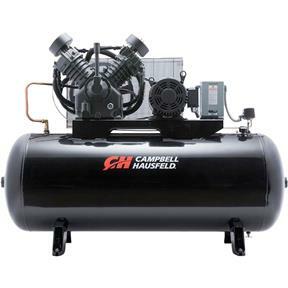 This MAXUS two-stage air compressor is designed and constructed for heavy-duty commercial and industrial applications. It features a cast iron, oil-lubricated pump with stainless steel valves, ductile iron crankshaft, ball bearing construction, oil sight glass and precision balanced flywheel. The pump operates at low RPM and deliver up to 15,000 hours of pump life based on B-10 bearing life. The 120-gallon tank is ASME Code and certified for 200 PSI maximum pressure. It includes safety valve and manual tank drain. The compressor features an open drip proof NEMA motor. Weighs 835 lbs.